Their third album Fryd, which means Joy, is the long-anticipated sequel to Fruen. It aims for new heights with freshly composed fiddle tunes, mixed with old tunes in new form. "An album that inarguably lives up to its title, which means joy." - Jim Gilchrist, The Scotsman. Norwegian-Swedish SVER has put on countless performances since 2008 at festivals and clubs all over Europe. 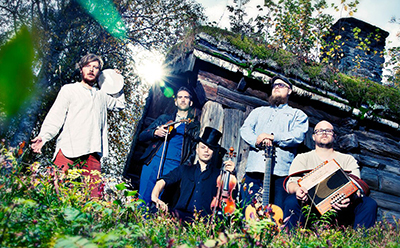 The last four years SVER has collaborated with the Swedish dance-hall artist Snakka San, and created the new genre Folkhall, playing in Scandinavia and have had multiple songs on the radio charts in Norway and Sweden. SVER will be performing at Lopez Center as part of their winter West Coast tour.